Did you know that our pets have an entirely different acoustic view of this world than what we do? When dogs and cats hear a sound, they will move their ears towards it in order to maximise reception. Ears can tilt and rotate, as they are controlled by at least 18 muscles in the dog. The ear’s shape also allows the sound to amplified. Many breeds often have upright and curved ears, which direct and amplify sounds. The ear canal of the dog is much deeper than that of people and creates a better funnel to carry sound to the ear drum. The average dog can hear the same sound about 4 times better than the average person. Most of us know about the dog whistle, but we forget that there are constantly sounds out of our hearing range that our pets are acutely aware of. Hearing range describes the audible range of frequencies. Frequency is measured in hertz (Hz), the number of sonic waves (sound pressure level vibrations) per second – the higher the frequency, the higher the pitch of the sound. The human hearing range is normally from 20 to 20 000 Hz. Dogs hear from 67 to 45 000 Hz! Cats hear from 55 to 79 000 Hz! Unfortunately, as with all superheroes, any power also has its weakness. While many people are enjoying fireworks and crackers over the festive season, your pet might be paralysed from fear. 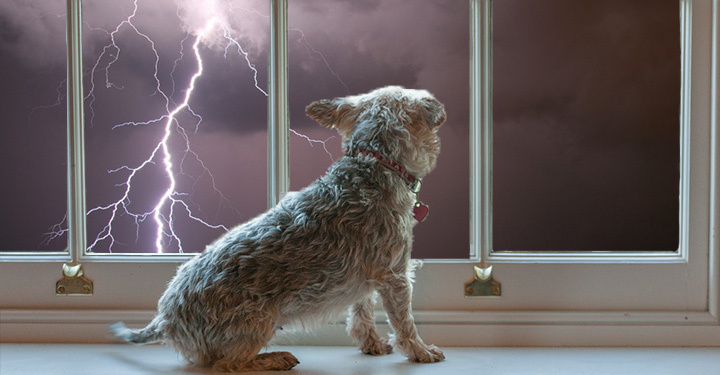 First and foremost – keep your pet indoors! This prevents most injuries sustained in moments of panic. Minimise harsh lighting and put on soft calming music. Your pet might also need medication to help it cope, especially if it suffers from severe noise phobia. Your veterinarian can assist you in finding the best option for your pet. It is advisable to start with treatment a few days before the worst events, so that you can communicate with your vet should the dosage need to be adjusted.